When it comes to online portfolios, it’s not just the examples of work that need to impress your potential clients, but it’s also the way they’re presented. The good news is you don’t have to be a coding champion to show your creativity and innovative thinking. With so many code-free tools like Wix, Weebly or uKit, you can create a beautiful portfolio without any coding knowledge. We handpicked some Wix-based portfolio examples for you to see how real DIY websites look like. Be inspired and inspire others! Vitanovsky.com is a very unusual and original Wix portfolio website of Tomas Vitanovsky – the sculptor, who creates unique pieces of art out of useless motorbike engine parts, chains and other gear. His works are really amazing as they combine the author’s passion for “moto” life and art. Just reach the Sculptures section to have a look at them and make sure they are really outstanding! Do you wish to find out how these amazing pieces are made? Then the info available in the How It’s Born menu section will certainly be of great interest to you! The website design is accomplished in a black-and-white colour palette with high-res images standing against the background. This website is worth the attention of everyone, who is interested in unique creative ideas! 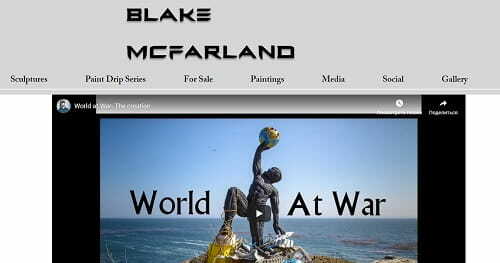 Blakemcfarland.com is a portfolio website of Blake McFarland, who is a real master of his work. His talent to combine things that seem incompatible cannot but impresses everyone, who is fortunate to have a look at the author’s collection. Blake primarily uses recycled rubber tires to create lifelike animal/human sculptures, but he also creates beautiful paintings. All the works of the author are presented in the corresponding website sections as well as in the For Sale category. 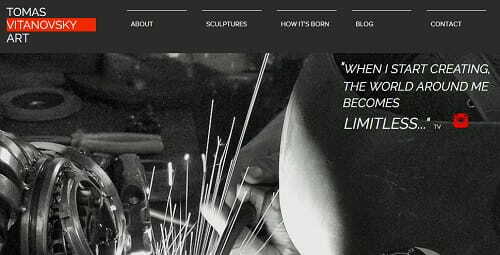 The best portfolio samples and the video of the process of sculpture creation are available at the home page, triggering user interest and urging the desire to browse the website. Rosslongphotography.com is a portfolio website of a Sydney-based photographer, who focuses on landscape, adventure and lifestyle photography. The website presents the gallery of his best works and prints offered for sale. The quality and professionalism of these works impress everyone, who sees them. To create better impression and highlight the colour saturation of each image, the photos are published against the white website background. The best full-sized photos make up the structure of the home page, welcoming visitors to browse the gallery. There is also a video here, which reveals the beauty of the location Ross lives in. Social network account access and contact info are available at the website as well to provide the most detailed information about the author. Markmcneillphotography.com is an impressive and informative portfolio website sample of Mark McNeill – a talented landscape photographer, who resides in the United Kingdom. The website has everything a user needs to find as much as possible about the photographer and his creativity. A catchy full-size image slider depicting the most remarkable photos of the author, a blog connected to the portfolio, the Art Shop and Signed Prints sections, where one can purchase photos, contribute to the functionality and informational value of the website. Mark’s fans and clients also have an opportunity to sign up for his personal YouTube channel without leaving the website. The Live Chat feature powered by Wix Management Solutions makes it possible to interact with the photographer and specify the info you are interested in. Inbetween managing creative teams, concepting various campaigns and writing scripts, Lexi Corn found the time to create this beautiful portfolio website Mostlexcellent.com. A great example of a well-designed portfolio that shows a number of projects she’s worked on. Simple, but effective. The website initially catches the attention of users by the bright and a bit unexpected combination of colors. The site looks quite simple at first sight, but it involves a number of design elements that focus the attention of a visitor on the author’s messages. The portfolio itself also stands out in the crowd due to the captivating video presentations, images and detailed description of each work. For those, who are interested in the portfolio and wish to get in touch with the owners of the website, the “Contact” section is available at the home page. There is also a chance to download the author’s resume in case of necessity. This is undoubtedly a notable benefit for the employers looking for skillful and creative people. PatrickThomasParnell.com is an illustrators website. Patrick Thomas Parnell based in Sarasota, FL. Patrick’s inspiring portfolio reflects his passion for comics and illustration. This well-structured website will give you a sense of the author’s brilliant work. The website is a great portfolio sample created on the basis of the Wix platform. The major design element that attracts the attention of each user right from the start is the background, which involves the works of the author mixed in quite an unusual way. If you are are interested in further information about the owner of the website and his works, there is an impressive main menu, consisting of 8 points. An extraordinary and remarkable example of the portfolio site that is definitely worth the attention! Speckmd.com – website, based on the same template as Patrick’s is. But it looks totally different. We love the high-quality fullscreen background image featuring an actual project completed in Miami, and the use of complementing colors. The only look at the website gives the user an idea of its conception. More detailed info is available in the menu provided on the top of the home page. The menu consists of 7 sections, including “Home”, “About”, “Built”, “Landscape”, “Conceptual”, “Awards/Publications” and “Contact”. Each section focuses on a particular aspect of the author’s creative work and provides the samples by means of using a convenient slider option. This makes the website browsing process entertaining and understandable. These characteristics are more than enough to conclude that the website is a successful portfolio sample created with Wix. 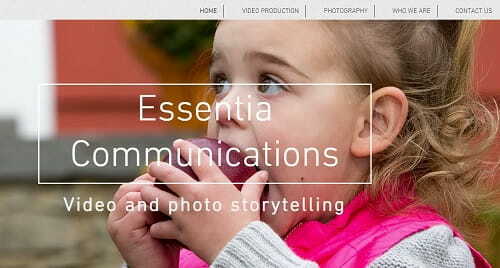 EssentiaProductions.com features a long-scrolling homepage that immediately catches your attention and guides you from one element to another making perceiving their content a pleasant experience. The homepage serves as a welcome page, an about us page and even a gallery. 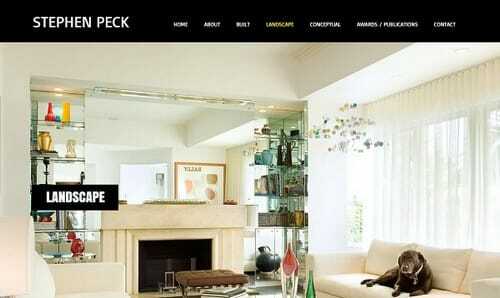 What we love most about this website is the designer’s meticulous attention to detail. Check out how they formatted the feedback form. Special attention should be given to the way the photo and video galleries are organized. Each user is given a chance to look through the samples of works of the owners of the site to see their merits and the level of professionalism that helps bring any story to life. This portfolio website developed at Wix platform deserves recognition and attention of the users looking for the top-notch video, photo and web solutions. KarlieKloss.com is a website belonging to Karlie Kloss – a supermodel and an entrepreneur. This is a harmonious combination of a promo site and a portfolio, revealing all the required into about the author. The design and the layout of the website is what catches the attention of users from the first seconds of visiting it. It’s easy to scroll down and browse a website to view the info about Karlie and some of her most successful works. Those, who are interested in viewing the entire portfolio, can get access to it directly from the home page. The colourful photos effectively stand out against the white background of a website. The hidden menu does not distract a user from the website content, while the social network buttons are clearly visible in the right part of the homepage. 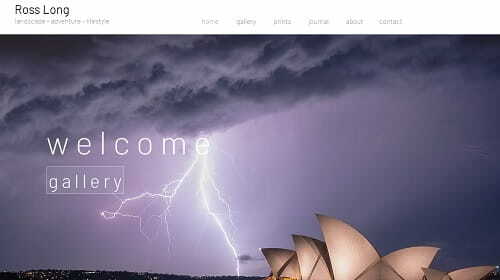 The website is one of the most outstanding samples of portfolios created with Wix. MysticMagicOnline.co.uk is a well-thought-out portfolio that reflects Ashley Pearce’s passion for exploring vibrant and colorful concepts, all of which pop against a bright background. The owner of the website is a U.K-based artist who designs and creates masquerade masks, headwear, wedding accessories and clothing. Mystique Magic finds the harmonious balance between aesthetics and functionality. The homepage features a slider, customer reviews and an impressive Featured in section that immediately lends credibility with its recognizable logos, including Vogue, Strictly Come Dancing and Schön!, among others. The website gives users multiple ways to follow the company: visitors can either sign up for Magic’s newsletter or follow them on Facebook, Twitter, Google+, Pinterest or YouTube. We were surprised to see that Mystique Magic’s blog was published on Blogger. Presumably, the company first created this blog and then built a full-featured website. Wix has a decent in-house blogging system which is in our opinion isn’t inferior to what Blogger offers. You may want to check out our collection of Wix-based blogs. Inbeetween creating his artworks and running the blog, Ashley found the time to add a store section to his website. In fact, there are two ways to buy from Mystique Magic: via the website using Wix’s commerce engine or by clicking on the Etsy banner on the homepage that will take you to the artist’s Etsy store. 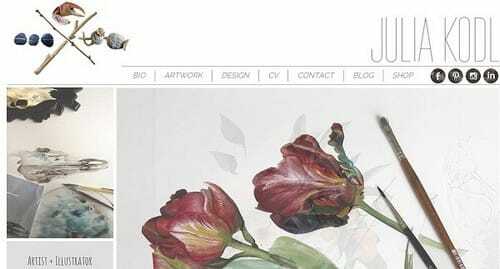 JuliaKodlArt.com is a website of Julia Kodl – California-based artist who used Wix to create an online portfolio that reflects not only her skills and talents, but also her personality. Julia has a superpower to capture nature in her watercolor paintings. The design of the website is minimalistic, simple and very elegant at the same time. The slider demonstrating the samples of Julia’s works contrasts with the white background of the home page and contributes to the better understanding of her job. The site comes with a personal owner’s blog and the incorporated Etsy Shop, where you will not only have a chance to purchase one of the masterpieces painted by the owner of the site, but will also look through the author’s bio and customer reviews. The Contact section offers several links to the social accounts of the artist to simplify the communication process. These are only a few features that make this portfolio website stand out in the crowd! Creating a successful portfolio is easier than you think! All you need is to pick a code-free site builder that will let you focus on the visual side of things, rather than technicalities. Keep it simple, easy-to-navigate, creative and remember to integrate some of the trending web design features; push your best content to the front and make it easy for you prospective clients to contact you. That’s it! Are you a Wix user? Then share with us your experience!